If a cream shadow is going to impress my lazy, I-don't-really-wear-eye-makeup self, it's got to give me tons of impact with minimal effort. For years, that's meant relying on the cruelly discontinued Josie Maran Coconut Watercolor Eyeshadows, which look like actual metal on my lids. I never thought I could find anything that could truly compare. Then Lyn posted this swatch and Ulta had its 21 Days of Beauty sale. I was armed with a gift card, friends, and I was desperate for a new cream shadow love. I ended up buying two of the Butter London Glazen Eye Glosses, which were half off during 21 Days of Beauty but normally retail for $24 each. I decided to buy the blue-brown duochrome Lyn had swatched, Oil Slick, and Unicorn, a newer shade comprised of pastel glitter in a clear base. The pots look tiny to me, but they actually contain 5.5g of product, which is pretty standard. For comparison, a MAC Paint Pot contains 5g of product and a Maybelline Color Tattoo contains a little less than 4g. The pots are hard plastic. Inside, you'll find a little plastic cover with a tab that covers the shadow; you'll want to hold on to these covers to keep the air out. In fact, you'll want to keep the covers and screw your lids on tightly, since cream eyeshadows dry out quickly in general and I'm told these shrivel up super fast. I did try to do old fashioned hand swatches of these cream shadows. Unfortunately, while they looked great on Snapchat and Instagram Stories, I couldn't seem to capture a decent still photo. Oil Slick looked flat and Unicorn disappeared completely. What gives? Well, these aren't really eye glosses, insofar as they don't stay wet on your eyes and give them that "glazed" look. They're actually super sparkly cream shadows; up close and in some photos, you'll see straight up glitter. But the shimmer is refined enough that, from a distance, these actually look glossy. Since they wouldn't swatch on my hand, let me show you some full face photos to give you a better understanding of what I mean. On the left, we have two layers of Oil Slick. On the right, we have one layer of Unicorn on top of the Rouge Bunny Rouge eyeshadow in Unforgettable Oriole. (I always use Too Faced Shadow Insurance as well, since my eyelids can get very oily.) 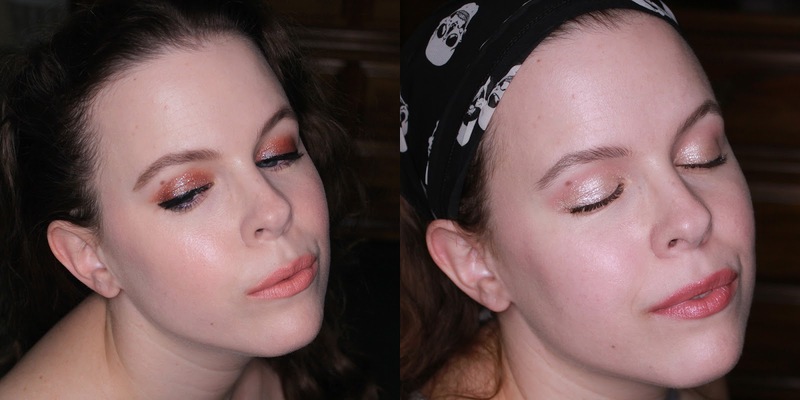 In both cases, I used the tiniest amount of product possible and blended it with my fingers. And in both cases, I think the Butter London product is the standout. Look at that shine! Look at that GLITTER! They're even prettier in real life. There are other benefits to this formula beyond the sheer sparkly goodness. 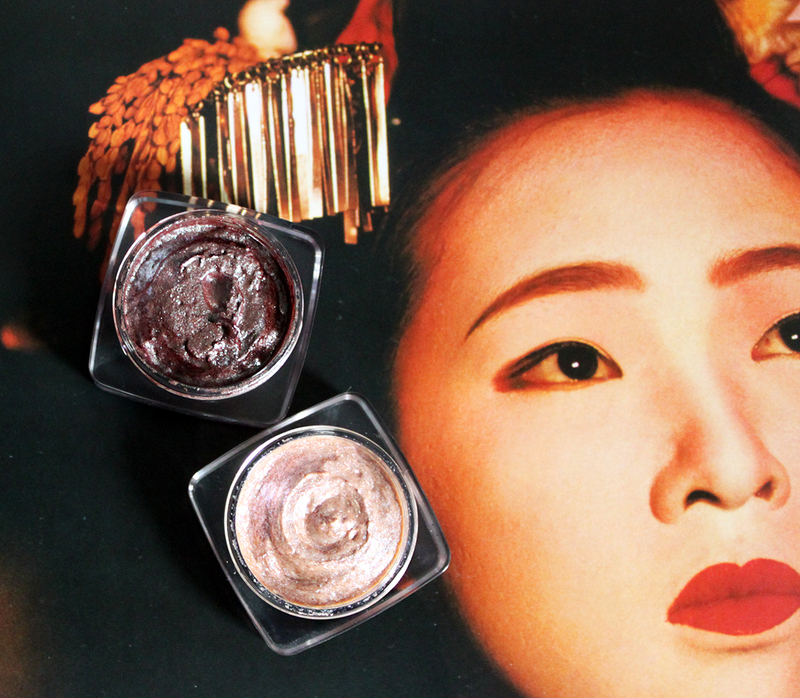 It has a very thin, gel-like texture that's weightless on the eyes. 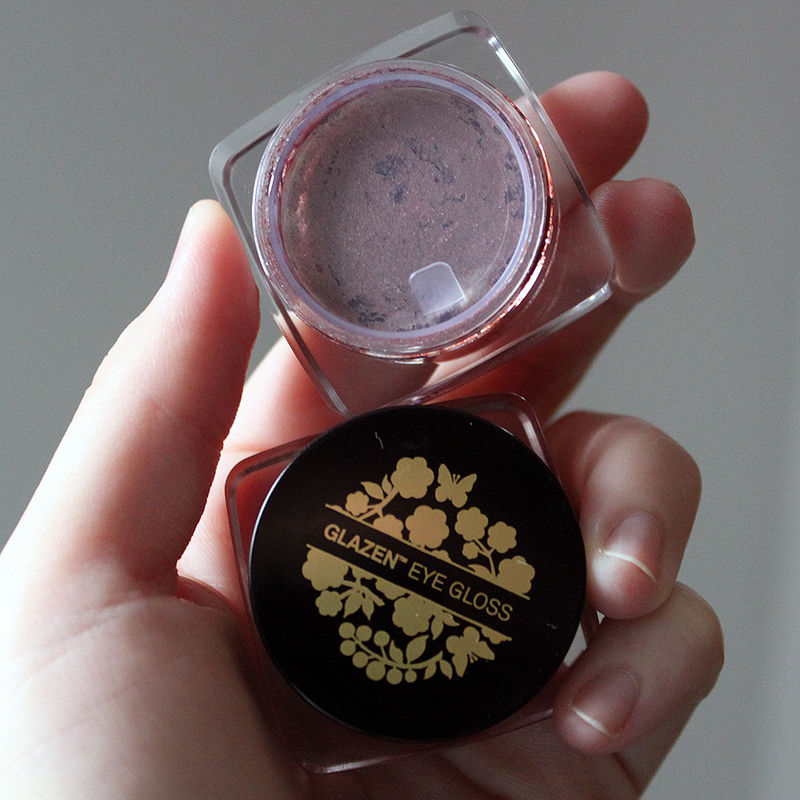 The Butter London Glazen Eye Glosses also dry down almost immediately, which means you'll have to work fast, but the upside is that they don't really crease and there's next to no fallout. Unicorn did drop a couple of specks on my face throughout the day, but when it comes to glitter, "a couple of specks" is nothing. So do the Butter London Glazen Eye Glosses replace the Josie Maran liquid eyeshadows? Technically, no. 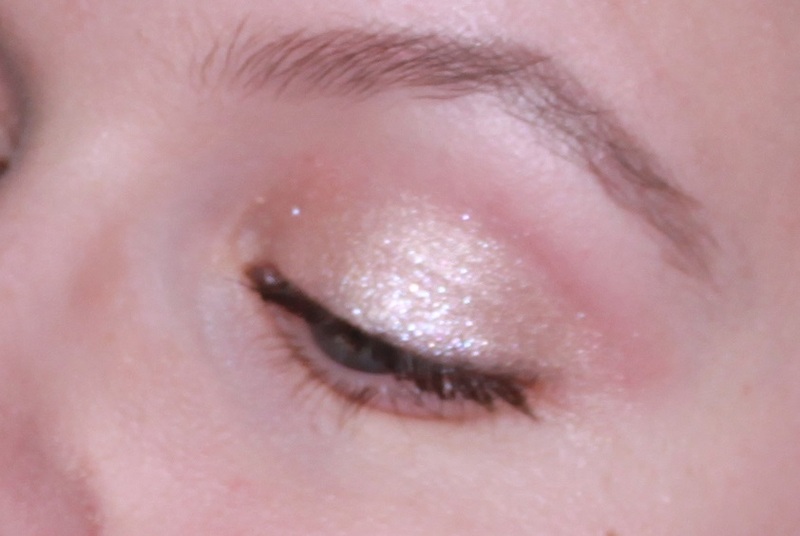 The Josie Maran product is very metallic, whereas these are very sparkly. But are they absolutely beautiful and highly recommended? Uh, yes! Dummy proof, long lasting, absolutely gorgeous glittery cream shadows? I am ready. The Butter London Glazen Eye Glosses are available at Ulta. I'm so glad you got these!! I have two, too. Oil slick and icing. It's true they don't photograph well, and they are so flipping gorgeous. I love mine! I'm now tempted by both Mermaid and Frosted, but Unicorn is pretty too. Hmmmm. I almost got Mermaid because it reminds me of Chanel Epatant, but I decided I wouldn't wear it enough. I'm pretty on the fence about these products...on one hand, I really want to give it a go. On the other hand, this might be a fad product that goes out of style soon and I'll be left with a bit of regret and a pot of eye gloss. I dunno, sparkly eyeshadow has been around since I was young. I guess it just depends on what you think you'll wear often. Well, you can't really go wrong with a blue-shift brown duo chrome, there's like a billion on the market, and i feel like that sort of thing has been going strong since the early 90's. It's really a question of whether this formula suits your needs. These are my 'one and done' go-tos in the morning when I have like 10 minute max to get out the door. I tap one on with my finger (light or dark depending on my mood) over the lid and a bit up past the crease, and then tight-line, mascara and I'm done. The nice thing about these aren't really the colours (tho i have found those to be very pretty and wearable) it's the formula. It goes on just sheer enough, then dries down super fast and i get very little fall out during the day. If I'm feeling super fancy but still pressed for time, I run something complementary through my crease before I pop these on the lid, and i look like I spent 20 minutes on my eye look. I'm seriously impressed by the no-major-glitter-fallout. You might like the Fiona Stiles Eye Veils. I think they're still on clearance at Ulta for $5.50. I'm so confused as to why they ended up getting rid of the whole brand. The few things I bought were wonderful. I did appreciate the low prices though! I haven't seen them, alas. It's definitely surprising how quickly that line left Sephora. You might find this interesting / exciting!